The early fame of BIS rested on their launching onto the world stage - in state of the art sonics - primarily Scandinavian orchestras playing often unfamiliar repertoire. Over the years, individual artists and ensembles have achieved world-wide recognition through the quality of these recordings and it is a model that - with the inclusion of South American orchestras - still produces discs of the very highest order. I am not sure I have seen a BIS disc before featuring one of the world's super-elite orchestras conducted by possibly the most in-demand conductor. Their presence combined with the ever-reliable BIS technical quality would seem to guarantee a perfect-storm of excellence. Certainly these Strauss performances from the Royal Concertgebouw Orchestra, with superstar oboist Alexei Ogrintchouk and conductor Andris Nelsons is very fine indeed. 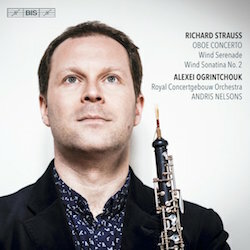 The disc opens with the late Oboe Concerto, taken from three days of live performances. The concert provenance need not concern anyone concerned about any audience participation. Ogrintchouk is a superb player - the technique is a given - the thing that is so impressive is his subtle phrasing, which repeatedly gives the melodic line a vocal quality. And this is surely what is central to all Strauss's music post the early orchestral tone poems. He was a composer fascinated, if not obsessed, by the human voice and this needs to imbue any performance. My only observation about this current performance is that it sounds quite "big" and hearty. Given music this glorious, that is a perfectly valid interpretation, but I do wonder if occasionally Nelsons encourages the Concertgebouw to play with more energetic weight than is ideal. Ogrintchouk possesses a rich and warm tone, too, which adds to this impression. A relatively lesser-known performance of this concerto comes from Jonathan Small with the Royal Liverpool Philharmonic with Gerard Schwartz and his naturally lighter tone, allied to a more reflective, often pensive interpretation, seems to me closer to the Autumnal twilight that this work embodies. If any admirers of this concerto do not know Small's recording I strongly recommend seeking it out. Another fine version which favours a lighter solo sound is the recording led by David Zinman and his Tonhalle Orchester Zürich with soloist Simon Fuchs. Interesting to hear the performance by John de Lancie - the American GI who prompted Strauss into writing the work. de Lancie joined the Philadelphia Orchestra after the WWII, but did not record the concerto until 1987. There are a couple of textual changes de Lancie made, including a brief cut and redistributing solo lines to woodwind colleagues - the most telling is de Lancie's choice of playing the original, slightly shorter ending as opposed to the extended revised version preferred by nearly every other recorded performance. Ogrintchouk is more in the honoured tradition of Lothar Koch's famed recording with Karajan and the Berlin Philharmonic - a performance that I have long admired. Next to Karajan I would have to say that Nelsons is more forthright and less nuanced as an accompanist - there is a directness to his Strauss interpretation that I noted elsewhere, when reviewing tone poems recorded with the CBSO. The very end of the work is a case in point - Nelsons, presumably because this is what Ogrintchouk wanted to - pushes the tempo to an extreme. Of course the Concergebouw plays this tricky passage with nonchalant ease, but it does sound fundamentally too fast to me. So a very enjoyable, very impressive performance, but one that does not delve into the deeper emotional recesses of the work. As an interlude before the disc's other main work, Ogrintchouk takes on directorial as well as playing responsibilities to perform alongside his Concertgebouw woodwind colleagues the very early E flat Serenade for 13 Wind Instruments. Strauss was just seventeen when he wrote this work and it is a mellifluous delight. The care of the instrumentation is remarkable for such a young composer - no doubt his father was a critical judge of his writing. Both here and in the big Sonatina No.2 "Happy Workshop" there is a sense of collaborative delight in the playing. If I was concerned that the concerto 'pressed' the music too much, here the sense of relaxed pleasure in the playing is palpable. The large-scale Sonatina - Strauss quite deliberately using a diminutive in the title to imply that somehow this was a minor work - runs to nearly forty minutes - is easily the most substantial of Strauss's late works. If the voice is a key inspiration, then the other abiding influence is the benevolent shade of Mozart. Indeed the work is dedicated "to the spirit of the immortal Mozart at the end of a life full of thankfulness". Mozart, like Strauss, wrote most of his music influenced to some degree by the human voice. Allied to that, after the traumas of the previous decade it is surely not hard to hear in this music a desire to seek out the universal values of beauty and purity that Mozart's music embodies. While the writing in the early Serenade shows remarkable promise and control, the Sonatina from more than sixty years later is a virtuoso display of woodwind textures and lyrical/contrapuntal writing. Strauss chooses an ensemble, which skews the timbral centre of the ensemble quite low. Only seven of the sixteen instruments could be termed fully 'treble' voices with a basset horn, bass clarinet, 2 bassoons, contra-bassoon and four horns ranged against them. This helps give the work a tonal richness which this performance brings out to the full. But again, both the composition itself and this performance is excellent at not making the music sound clotted or thick. A particular pleasure is the fluidity of the playing. I imagine this must be a delight to play and as such it has benefited from many fine performances over the years. I remember the performance led by another oboist with Dutch players - Heinz Holliger and the Netherlands Winds - dominating the catalogue for many years. I must admit to not having listened to that version since the days of LP because I have an abiding memory that its quality resulted in a slightly homogenised, levelled out textures and dynamics with much of the work's remarkable energy and joyfulness reduced. There is a very fine set of the complete Strauss music for winds on Hyperion featuring an elite group of London players led by Michael Collins, which again features typically fine engineering from that label to match the calibre of the playing. That said, hard not to hear in this new recording a level of ensemble playing that comes from regular performing together. BIS present this as an SACD disc. I listened to the stereo SACD layer, not the 5.1 option, and it sounds very fine in that format - more so in the Sonatina/Serenade than in the Concerto. Indeed the soundstage for these wind ensemble works is of demonstration quality. In the concerto, I found the oboe to be a fraction too forward and full for the nature of the music itself. For those put off by the perceived bombast of the early tone poems or the nature of the operas, the late Sonatinas might well be a point of entry into the enduring genius of Strauss's music. The 2nd Sonatina receives as good a performance as I have heard, so good that one hopes that Ogrintchouk will be able to return to the studio with his colleagues to complete the set or perhaps couple the 1st Sonatina with the Mozart Gran Partita.